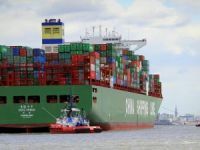 The leading players in the container shipping sector hope to muscle aside smaller rivals by unleashing a wave of mega boxships during the biggest dip in global trade since World War II. 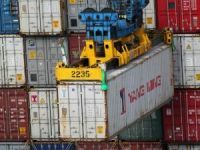 As freight rates plunge, the leading players in the container shipping sector hope to muscle aside smaller rivals by unleashing a wave of mega boxships during the biggest dip in global trade since World War II. 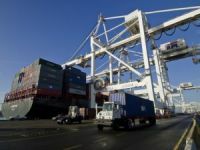 The trend could keep sea freight rates depressed well into 2010 which is good news for their customers, the millions of businesses big and small that import parts and products from overseas. But it's likely to spell pain within the shipping industry and could precipitate consolidation as smaller players are pushed out. The big post-Panamax vessels, carrying up to 14,000 TEUs, can result in greater economies of scale if shippers are able to fill their giant holds. Thirty-five of these mega boxships are scheduled to enter into service 2009, doubling the number operating today. They'll make up roughly a quarter of the net increase in container capacity and by 2013 some 200 ultra-large ships will be in service around the world. 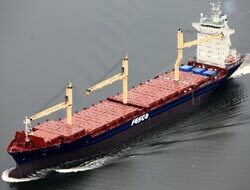 Meanwhile, a vessel capable of carrying 22,000 containers has been designed by South Korea's STX Shipbuilding. Shippers are eager to avoid partially filled vessels at almost any cost. 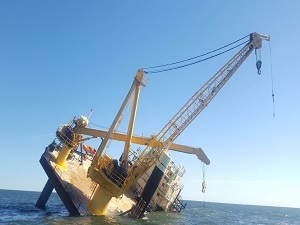 "To fill their big boats, these guys will cut their price to any level for customers," said Dirk Visser, an analyst at Dynamar NV, a Dutch consultancy. According to the most recent data available, the U.S., Japan, China and the European Union all suffered 10% declines in exports in November, auguring a bitter 2009 for global trade. Yet shipping companies aren't expected to cancel many orders for new ships thus allowing the global fleet to increase by over 12%, way ahead of expected demand. Two European billionaires are leading the move to mega ships. Gianluigi Aponte, owner of Geneva-based Mediterranean Shipping, has ordered 48 ultra-large vessels. His strategy is to gain market share by building bigger ships and aggressively recruiting customers, said people familiar with the company. MSC is the second-largest container shipper in the world, with 450 vessels, behind Denmark's A.P. Moeller-Maersk, with 500 ships. 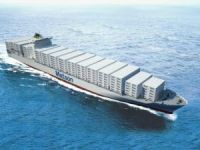 Marseille-based CMA-CGM, has ordered 37 ultra-large boxships. Recent analyst reports predicted rates are unlikely to rise until the end of the economic downturn. 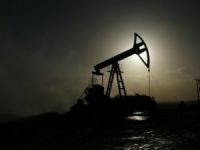 "The challenging environment could continue in 2010 until a demand recovery narrows the demand-supply gap and improves the level of profitability in the sector," a J.P. Morgan & Co. report said.